This antenna provides multi-band omnidirectional coverage for fixed or mobile applications operating in Cell, PCS, and Wi-Fi frequencies. PCTEL's new low-profile multiband antenna from wpsantennas.com supports numerous telemetry applications that require efficient cost effective collection and communication of information. Ideal applications for this model include wireless monitoring of utility gas and meter reading, Energy/oil/water control, Land Surveying, Vending Machine, and field measurement. This antenna provides multi-band omni-directional coverage for fixed or mobile applications operating in AMPS, PCS and Wi-Fi frequencies. 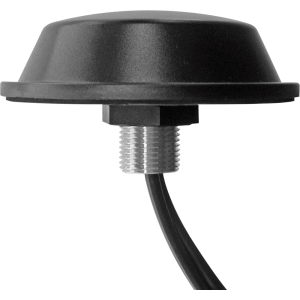 Featuring a durable, very low profile radome and integral stud mount base for through hole installations, this antenna is ideal for vending machine, meter reading and other telemetry data tracking applications requiring a discrete antenna solution. NOTE: Can be custom made with any cable length and connectors you require - contact us for availability. Unless otherwise noted, PCTEL GPS antennas are custom made to your needs. They generally come with Two 3 ft Pro-Flex Plus 195 terminated in SMA male for the Cellular/PCS and RP-SMA male for the WIFI side. Please contact us if you desire a custom terminated solution.